Just a few weeks ago, I wrote a post about how we had our first travel hacking win! Back in December (just about one month ago), we received our first 50,000 bonus points (Chase Ultimate Rewards®) for meeting the minimum spending requirements on a credit card (Chase Sapphire Preferred®). The points earned from that first card (opened in my name) are worth a minimum of $644.17 if redeemed for cash. Hopefully they will be worth a bunch more when we decide to use them for our family to travel someday. We actually have a goal to take a trip to Hawaii for our family of 5 in a few years and are busy building up our travel rewards portfolio of points. 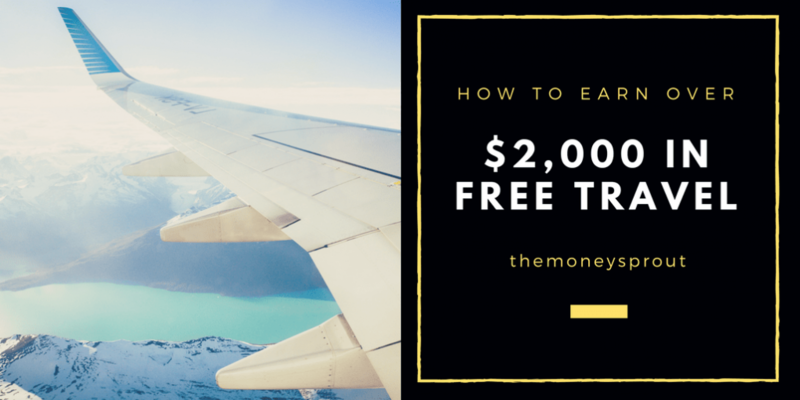 The goal is to make this trip as cheap as possible … or maybe even FREE? So fresh off the success of our first travel rewards card, we opened up a second card (in my wife’s name) and a third card (in my name). We recently finished up our minimum spending requirement on card #3, which is the Chase Ink Business PreferredSM. This latest card has a minimum spend of $5,000 in the first 90 days to earn the 80,000 bonus points. This is much higher than the first card we opened, but the card does come with a $95 annual fee that cannot be waived in the first year. It is now time to celebrate again as we just finished up with our minimum spending and watched over 100,000 points hit our account! How Did We Use Card #3? We hit our $5,000 minimum spending target exactly 5 weeks after signing up for the card. Considering the card didn’t come in the mail until 7 days after the signup … it really only took us 4 weeks to hit our minimum spend. The strategy for this card had already been planned out long in advance. Since this card has a higher spending requirement compared to our first card ($5,000 instead of $4,000), we knew it would take some extra planning. Since we are homeowner’s, we pay property taxes to our county every year … by January 1st. Our property taxes this year were $3,894.12, so we took advantage and put that charge on our card to quickly knock off almost $4,000 of the spending requirement. One downside of paying our property taxes with a credit card however was the 4.65% service fee that was charged. We were aware of this fee in advance and it still made sense to use the card in this situation. If we were to have written a check, the service fee would have been waived … which cost us an extra $101.25. In any normal year, I would never even think of paying this service fee on our our property taxes. But with the potential to earn 80,000 bonus points from this card … we made the exception. Unfortunately, we had some issues with one of our furnaces which required two separate maintenance calls and about $1,000 in total charges. Remember … owning a home is not cheap … especially a bigger home than you need! We also had a little travel over the holidays which we put on the card and I renewed the LLC license I have for my business (the one true business expense on the card). Besides those large expenses, we had another ~$2,200 in charges for some groceries, gas, utilities, and holiday gifts. In total, we spent over $7,000 on our card in about 2 months. Our spending actually went over by almost $2,600 from the minimum spend goal on this card. Most of this was due to our furnace going out and needing repairs. Since we had basically already maxed out our minimum spending on all our other rewards cards, it didn’t really matter which card we used. The good news is that by reaching our minimum spending on this card within the first 90 days, we earned our 80,000 bonus points! Overall, we earned over 100,000 Ultimate Rewards® points from this card. Here is a recap of the points we have earned on card #3 on our travel rewards journey. We spend almost $7,700 on our card in about 2 months, which gave us 7,698 points right off the bat. We also got an extra 493 points for our travel expense over the holidays. This card pays 3 times the points for travel expenses. I was also able to manage a 20,000 point referral bonus for getting my wife to sign up for the same card (which is our card #4). We did this with our 1st and 3rd cards as well … but that referral was only for 10,000 points. If you and your spouse open separate cards, I highly recommend using the referrals. Finally, we got that awesome 80,000 point bonus for hitting our minimum spend! This gave us over 100,000 points from using this card. At a minimum, these 108,191 points are worth $1,081.91 if redeemed for cash (or $0.01 a point). That is actually a mortgage payment for us! Since we plan on using them for travel, they should be worth more … maybe even up to $0.02 per point. That type of redemption would put the value at $2,163.82 or more. Eventually when we redeem these points, we will cover the value they return. Note – I would like to point out that the true cost of these points would actually be $196.25. The annual fee for the card ($95) plus the service fee we paid on our taxes ($101.25) were not normal expenses. We would not have made these payments with our normal spending. Overall, I would say that $196.25 in extra spending is worth it. Since we already paid the $95 annual fee on this business card, we will keep it open for a while. This will give us a chance to figure out where to keep all of our Ultimate Rewards® points. We have several options (basically cards #1 through #4), which I hope to start exploring very soon. In the meantime, my wife just finished up her minimum spend on card #2 and is now actively working on card #4 (the business card in her name). After all those 4 cards are finished, we will have earned just over 308,000 points, which is incredible. That should happen sometime in February. Those points will be worth at least $3,080! Even if we never use them for travel (which we still plan to do) … that is an incredible return for travel rewards. We haven’t spent any extra money than we normally would have … except the fee’s I covered earlier. Just simply planned out our spending in a smarter way to leverage these card bonuses.